This month has been a little slower, and the sketches slower still. 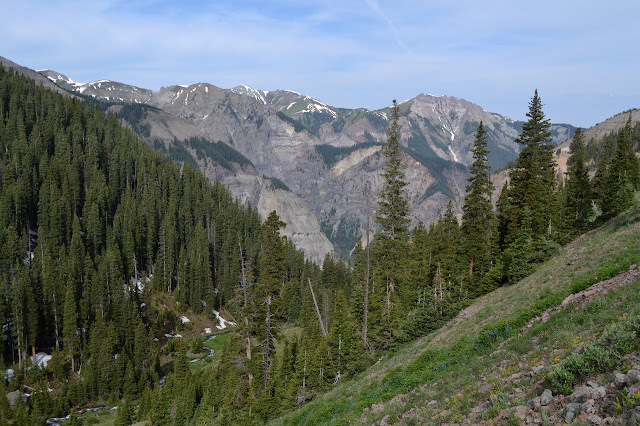 Finishing off my loop through Uncompahgre by wandering way off trail for the view. Back home and checking out they area around Figueroa Mountain while it is "cool". (Day 3 of 3) The rain overnight was not so bad as we feared it might be. It was actually stopping as we set up and cleared off overnight only to cloud up and rain again shortly before morning. None of the rain was particularly hard. It is clearing again as we get up and everything is drying quickly. 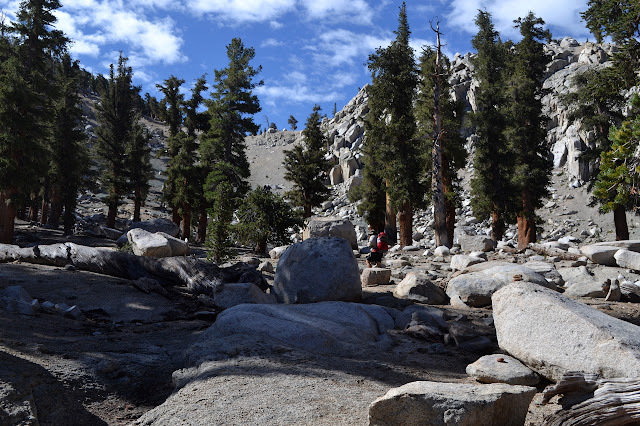 First, we have to finish what was supposed to happen yesterday, a short jaunt up and over Coyote Lakes Pass. 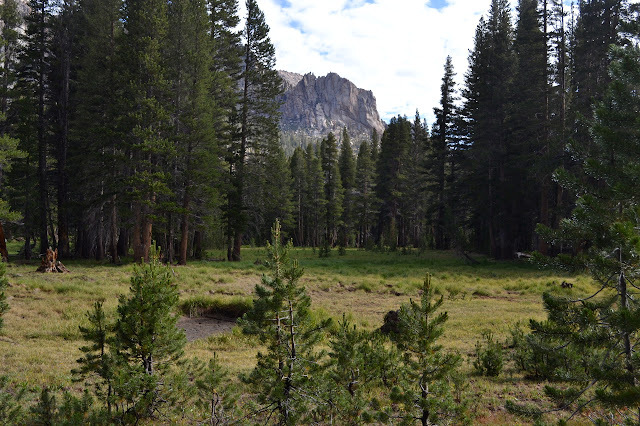 Trail wraps around the edge of the meadow to a well established campsite, then gets headed toward the pass. It seems to make perfectly straight lines as it switchbacks up the last couple hundred feet. Water can flow here, but currently it is a dry meadow moistened by rain. 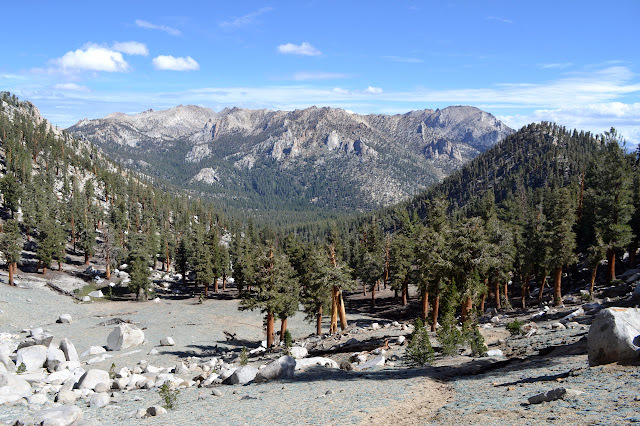 Coming up to the north side of Coyote Lakes Pass, which is not so big, especially if starting out at around 10,000 feet. 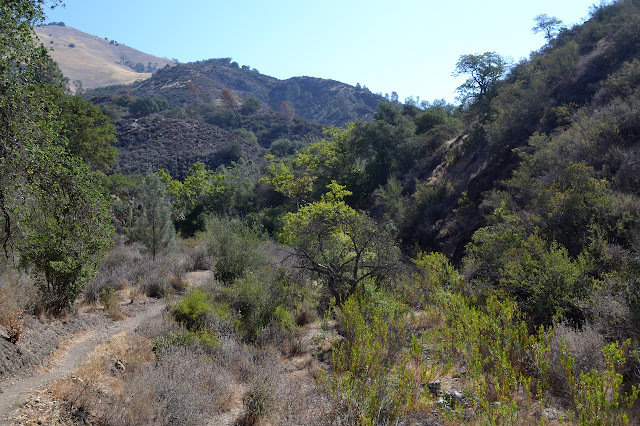 Looking back over the bowl that is the headwaters of Coyote Creek. (Day 2 of 3) After getting a mound of water for breakfast and another mound for hiking for the day, a procedure that seems to take forever with a Sawyer mini, Bernard is somehow still sleeping. The shaded creek is full of tiny Humboldt lilies and I enjoy my nice hot breakfast before giving him a little kick to get started on the hiking for the day. Today we climb and, as far as we know, this is the last water before the lakes at the top. The trail is a lot easier to find as we start today than it was as we ended yesterday. Humboldt lilies are among the thick green around Rifle Creek. 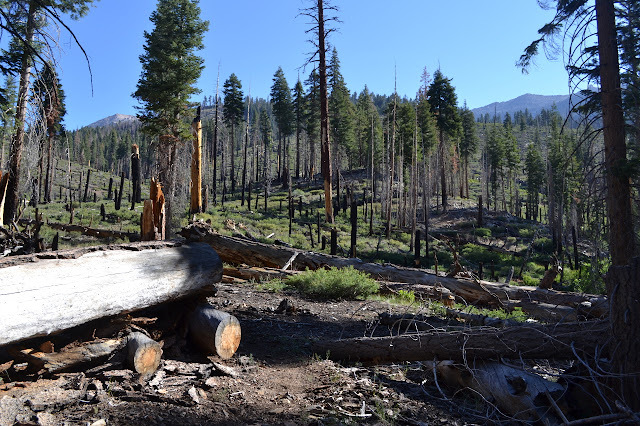 Back out into the scar left by the 2012 Lion Fire, but at least some sawyers have come by. 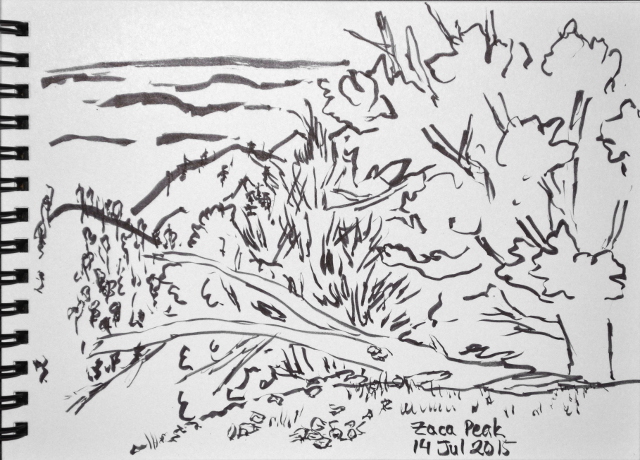 The trail becomes faint in places as we twist up through the forest. There are still a few big logs to jump over, but it is not so bad that the few mule prints we find on the trail seem out of place. Pistol Creek is gurgling along just fine as we come to it. A glimpse up Farewell Gap is surprisingly familiar from seeing it on the other side. Far to the south, over one ridge, there are the tiniest little thunderheads developing. Peeking out through, perhaps, Shotgun Pass, are some rocks that became familiar when hiking past them out from Little Claire Lake. (Day 1 of 3) Bernard wanted to hit the trail for a few days, which became a few less days. When he was saying 5 days, I was thinking Woodchuck Country and Blackcap Basin, but when he said we would have to be back by Monday, I quickly changed to the peaks I looked at last November and decided I could not include after all. The unknown nature of water availability was the problem then and is still a problem now, but easier to deal with on a shorter trip carrying less food. After calling in for my permit, I realized I could do the loop clockwise and water would probably be easier on the way up. We must have psychic people filling these out, because that was how my permit was already set up for me. We dropped ourselves in Lewis Camp the evening before, ready to hit the trail in the morning. 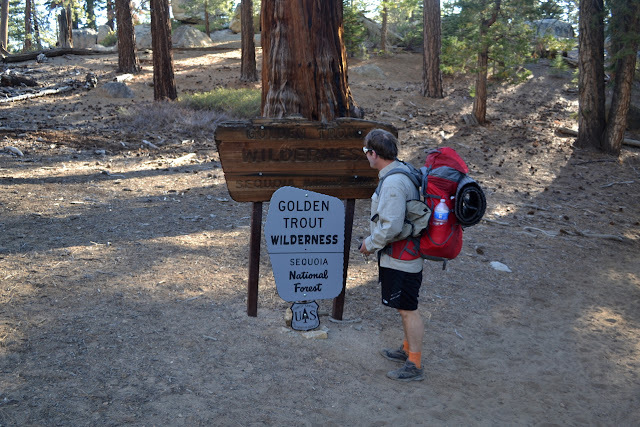 Again entering Golden Trout Wilderness from Lewis Camp. I was told to expect water only at the river and lakes because of the drought. This is workable, but not ideal. Meeting a hiker on the way out, we get a little better news. 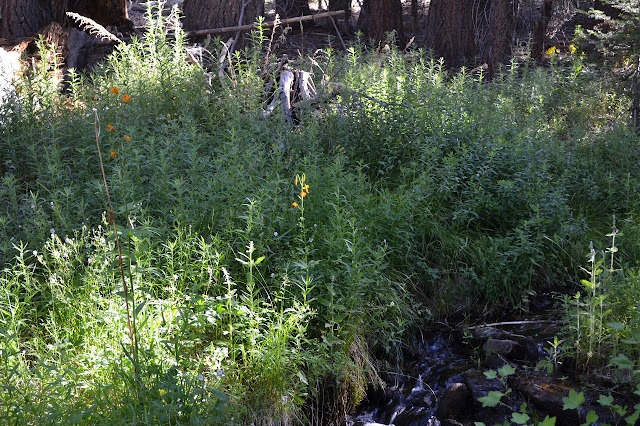 He says the creeks are fairly dry around here, but as we get higher things get wetter. We also accuse him of being from Santa Barbara, since we saw a Cottage Hospital sticker in the parking lot. He is not that one, but he is from the county and teaches at Midland School. It seems a little odd that half the vehicles in the lot come from the same somewhat distant county. 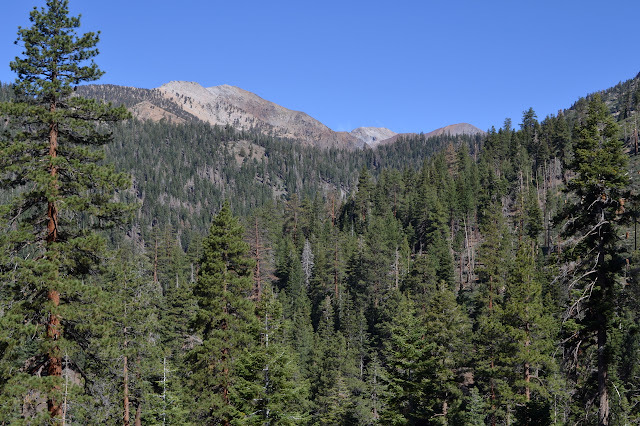 Of course, after commenting on it, we go back to wandering down toward the Little Kern River and enjoying the views through the trees. There are many granite domes close at hand and far across the valley are the twin peaks we are aiming at. A section of trail as we drop down into the valley. One of the nearby domes. 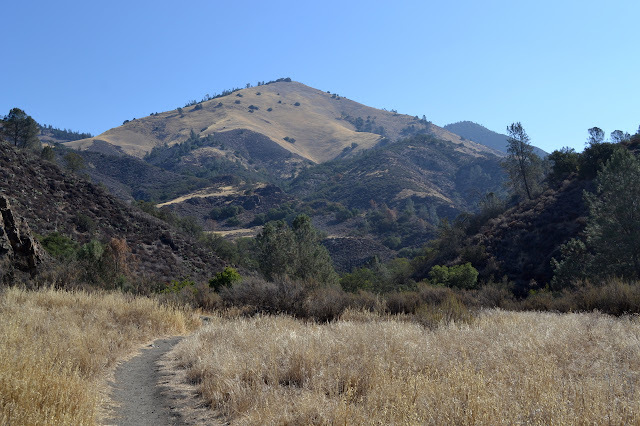 The weather prediction for Figueroa Mountain has it topping off around 82°F and, feeling a bit like I have neglected the area, I decided that was cool enough. I have hiked in that before, I can do it! With just one bag of water even! Good sense overcame me at least a little, so I arrive at the trailhead with two bags of water, about 5 L total, for the planned 12 mile route. I also have a printed out permit because the first part of the trail is on private land with fairly freely granted permission. The marine layer is still out and keeping things so cooler than expected, but it will burn off soon. I grab some parking just past the bridge and watch a truck with a telephone pole maneuver the tight turn while I get my shoes on and make sure everything is set in my pack. 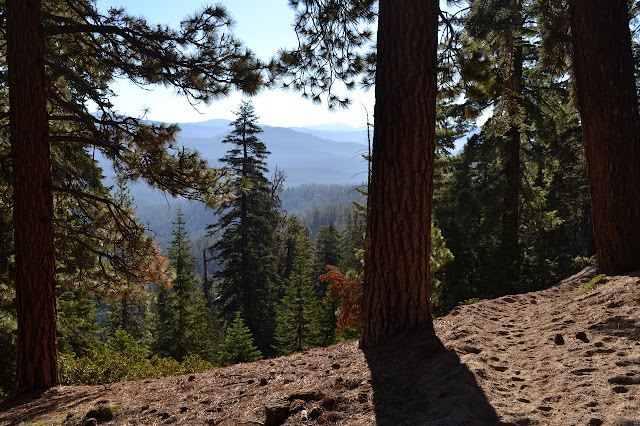 There is a good map, with topography as well as the trails and routes, at the start. Three trails leave from here, one to the left through a green gate, one to the right somewhat along the road, and one up the canyon. I follow the one up the canyon. Grass Mountain is quickly found looming ahead. The trail starts off in trees, but quickly leaves. I am quickly out from under the thinning marine layer as well. Well used trails head off in odd directions, but sticking to the canyon keeps me on track. Trail junctions are marked at first, even when it is just secondary route for horses to use, but then I pass by a few that are not marked. Keeping to the canyon is still the right choice until a post with the sign removed. After this, the canyon takes a turn and there is a campsite. 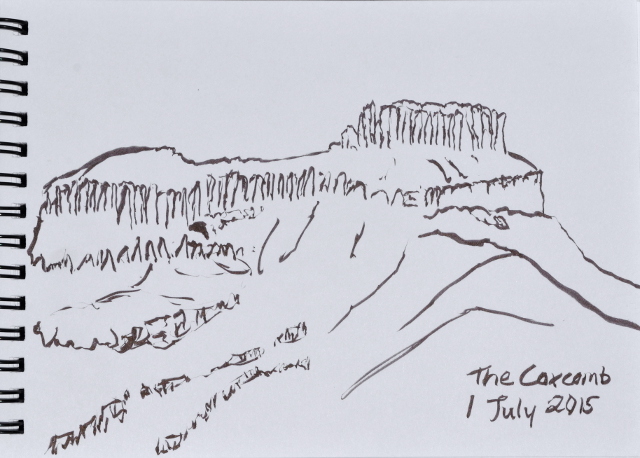 I start to climb up out of it on the side away from the mountain and decide that cannot be right, then try to find my way further up the canyon on something that is certainly not the canyon trail before heading back to try the marked, but unsigned, trail. Trail along the side of the canyon. Following the trail up from the post works much better. The trail winds upward and seems to have been rerouted in a few places. This goes on until a saddle just past a nice shade tree. 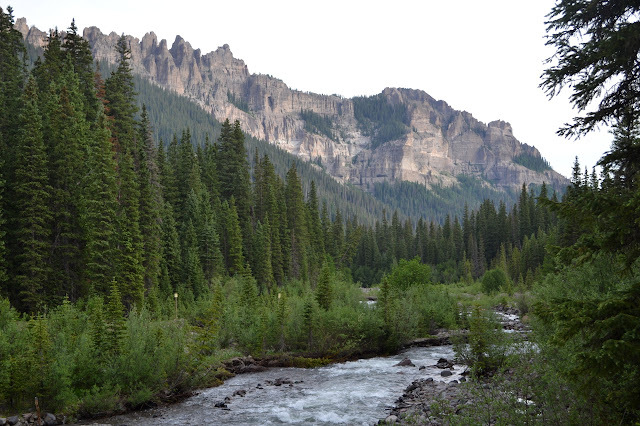 (Day 6 of 6) Today will mostly be road walking to get back to my parking at the trailhead on the East Fork. It is sort of like a small payment for a great hike, and may not be all that "expensive" anyway, since the area is so nice. 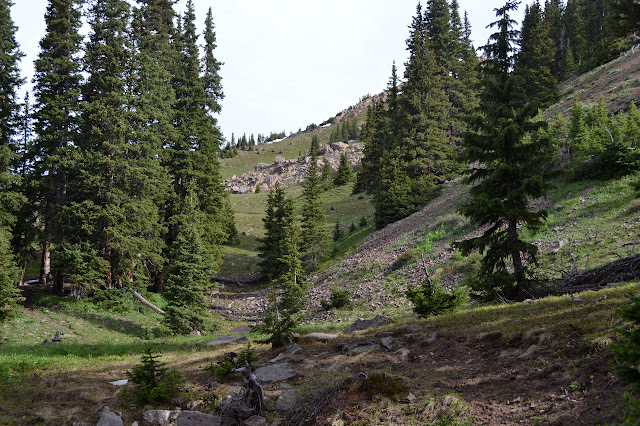 I think I am within a mile of the trailhead, but did not notice the trail up Porphyry Basin, which might have been an excellent spot to camp, yesterday. That would put me quite a bit further up the trail than I think. 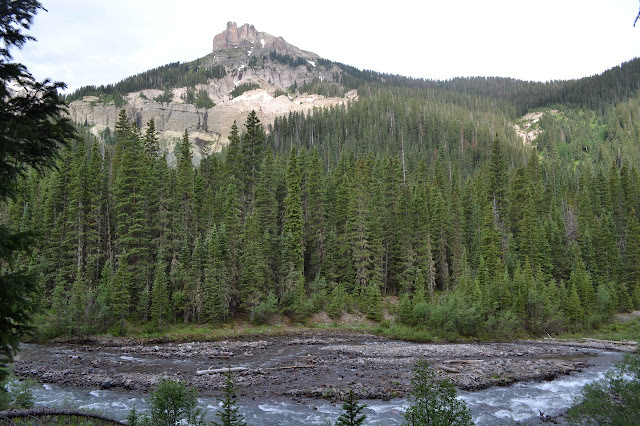 Down by the Middle Fork Cimarron River and down in the trees. The wilderness boundary follows the river along here and so signs dot it in the middle to say so. (Day 5 of 6) It was a chilly night, but only because my flat spot was next to a little leftover snow and the ground next to it was still quite cold. Today is all valleys and passes and just seeing how far I get. Packing up, I cross the creek and swap my shoes for the hikers. It is just easier to wade it than to find a crossing spot. 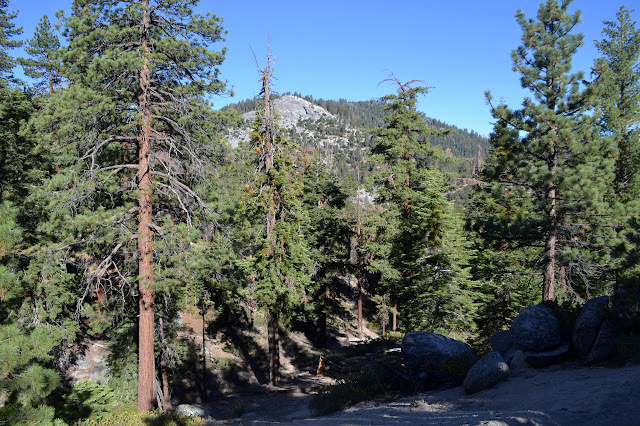 The trail drifts upward again, away from the trees and back into views. And back along the trail in Middle Canyon. Trying to leave Middle Canyon.